Attention Class of 2015 High School Seniors! Those yearbook deadlines will be here before you know it! Save some money by getting your senior portrait session scheduled early. Book on or before July 30th 2014 and receive 15% off prints.We’ve got lots of innovative and stylish sets, props and effects to create a look that is as unique as you are. Call to reserve your session today. 812-626-1186. Offer expires July 30th 2014. No cash value. Not valid with other offers. Fashion Friday – Family Portraits: What to wear? Are you stumped as to what to wear for your Family Portraits this year? 1) Decide if you want the portrait to be dressy, casual or somewhere in-between. 2) We will work with you in deciding on a location. Choosing clothes that go with the location is a must. 3) Stick with two to three main colors to work with like red, black and gray or turquoise and brown, anything that coordinates well together. The thing to keep in mind is to find coordinating colors for the whole family, not necessarily the same matching colors. Start with the person who is the hardest to choose clothes for. You may want to do this before picking colors if they have a limited color palette. Then then use the colors in their choice to determine the rest of the clothing. Layers work great in pictures. You can easily accessorize with scarves or vests or layer your clothing for the family picture! We discourage “Matching” clothing items, even for multiples, but you have the final say. 4) Avoid any items of clothing with writing or logos as these really date an image! If the clothing is noticeable in a portrait, it will become a distraction. Clothing that does not attract attention to itself should be your goal. Ladies should avoid really short sleeves, try to wear mid-length or long-sleeves. Men look best in a dress shirt and sports jacket or polo shirt or sweater. 5) Now go to every one’s closets and pull out any options in the color scheme you chose. Bring all the clothes to one room and start laying out the options. Think of who will be next to whom in the portrait as well while laying them out. Keep changing your options until you get something that you like. Keep in mind that you are looking at the group as a whole, not individual pieces. Try not to have any one item stick out too much (unless it is intentional!) You may have to go buy an item or two but by trying a bunch of different combinations, you can usually find something that works without buying a lot. We recommend you take a picture of each grouping because it is easier to see and if it stands out now it will show even more in your portrait. Clients have sometimes sent us the images of what they have in mind and we’ve given them our input. 6) Look on the web for ideas. A lot of clothing websites will have outfit ideas for you as well if you are really stuck. 7) Most importantly, don’t get worried about finding the perfect outfit for each person after all the portrait is still about the people in the clothes not the clothes themselves. Just relax and have fun. Don’t forget to sign up for our limited (12 sessions) $60 Summer Kickoff Mini-sessions on June 28th, 2014. You’ll get 10 images available through digital download so you can print them anywhere. Call us at 812-626-1186 to get signed up, they are going to go fast! Are you still taking blurry pics? If so here are a few tips on how to fix that! Read your owners manual: This is probably the most important thing that you can do to take good photos. You should know what each sitting does and what each button controls on your camera. This will not only help you understand your camera but how & where to make changes to any maunal controls you have quickly and easily. Check your shutter speed: LOTS of blurry photos are the result of a slowshutter speed. If you don’t know and don’t want to know what shutter speed is, you can use the Sports Mode of your camera. basicly the the slower the shutter speed the longer your camera takes to capture the image. and the longer that the shutter is open the more shake(blur) it will add to the image if you are moving at all. Focus on the subject: This is another thing that seems simple enough to know, but is another big reason why your shots might be out of focus. Most DSLRs will have multiple focus points to choose from, you should know how to change them quickly(see owners manual). If you have a point and shoot, you may not have any control over where the camera is focusing. If your camera chooses the subject to be something other than what YOU think it should be, your photo will turn out blurry. Remember to check your owners manual to see if you have any manual control of focus points. Hold still: I know that this should be evident but you would be surprised how many time we forget to do the simple things in life. When you are taking your photos, make sure you are holding steady. If you are standing, lock your elbow tight to your body. If you are having a hard time keeping yourself steady, use a wall, a table, anything the is going to support you and help keep you still. Get a pod: wether it’s a Tri or Mono. If you are wanting to be mobile then look at a Mono-pod for ease of use with good stabilization. If you don’t need to move quickly or at all then look into getting a Tri-pod to help ensure a stable camera. Now remember, lock your elbow, breath out, squeeze the trigger and get the shot. What are you waiting for, get out there and see what photos you can capture. So today’s post has some tips for getting better shots when you need to take photos indoors. As much as you may love taking portraits with beautiful sunshine during warm summer months, it isn’t always possible to photograph outside in the sunshine. Whether it’s too hot in the summer or cold in the winter, it could be too windy or your subject may just not want to go outside when you want them to (insert your own childern here). Tip 1 – Use as much natural light as possible. Having natural window light always helps when photographing indoors. Any window can be used depending on the time of day as long as there is no direct sunlight coming through. For instance, an east-facing window will be flooded with direct sunlight early in the morning. However, that same window will be perfect in the afternoon due to a much softer light. The opposite would be true of a west-facing window. The light your windows receive will also vary with the time of year. Look for great little pockets of light around your house and use them. Tip 2 – Adjust your ISO for available light. Don’t be afraid to increase your ISO! Most cameras, even today’s point & shoot styles, can adjust the ISO. They also have the ability to handle ISO speeds from 100 to 2000 depending on how much light is available. Remember, there may be some graining at higher ISO speeds. Play around and see how your camera handles higher ISO speeds. This is one area where newer cameras are much better than older ones! If there are any “tips” you would like to see, post a comment below and we’ll do our best to answer them in another post. Thanks! Well it’s finally that time, where have the last 4 years gone? Our daughter Megan is among the first 68 students graduating High School from New Tech Institute in Evansville, Indiana. In the beginning there was a lot of unknown since they were the first and only students in the school. As freshmen they were already upperclassmen/women. They ruled the school with Trust, Respect & Responsibility from the start. They have had 3 principles, seen many teachers come and go, dealt with class scheduling/availability issues and many other hic-ups along the way during the 4 years they have been there. But through it all they have worked as a single student body to grow, learn, teach and inspire. These students built friendships & faith in each other that will carry them in to the world that will make our future bright with possibilities. Now a little about Megan, she went to NTI with the hopes of a new way of learning, thinking and a lot less drama. What she got was so much more. She found new friends from around the city, opportunities to grow and mature as a young woman, and inspiration from a young new teacher that would change her life and give Megan drive, conviction and a career path to do the same for other children. That teacher was Mrs. Weber, she took Megan from a little girl who was struggling in math and showed her that math can be fun, and even more fun to teach. Megan caught on quickly with Mrs. Weber’s guidance and soon helped show other students in the class how to solve the problems. What I don’t think Mrs. Weber was counting on (ha, get it) was she was also creating a peer, someone who would want to join the ranks and become someone just like her. Megan has gone on to become a member of the Nation Honor Society in addition to graduating with an Honors degree. When I dropped Megan off at the door that first morning back in 2010 I told her to stop, look around and take in this moment, lock in your brain because you will wake up “tomorrow” and it will be the last day of your senior year. Well here we are, this is the last day of her Senior Year. Today she graduates from High School. Why didn’t I listen to my own advice, I can’t believe this is it, I swear it was only Yesterday she was getting on that big yellow school bus for Kindergarten waving good-bye with so much enthusiasm while a piece of me was crying behind the smile as she rode off. Megan, your mother and I are so proud of what you have accomplished during this time and want you to know that we are HONORED to be your Parents. Being a parent on the edge watching everything unfold has been exciting, and nerve-racking but seeing the kids of NTI mature so much in 4 years is a testament to the teachers and faculty around them. But to be one on these “Pioneering” students it must be special to be a part of something that never was before, to take that chance on blind faith alone that it would work and they would come out on top, I can’t even imagine how that must feel. I can only watch in awe as they move forward in life with the knowledge that because of them many more will follow. I, along with my wife and family want to wish our daughter MEGAN TAYLOR WOLFE and the rest of the Inaugural Graduating Flight(class) of 2014 from NTI a loud and proud Congratulations for a job well done. 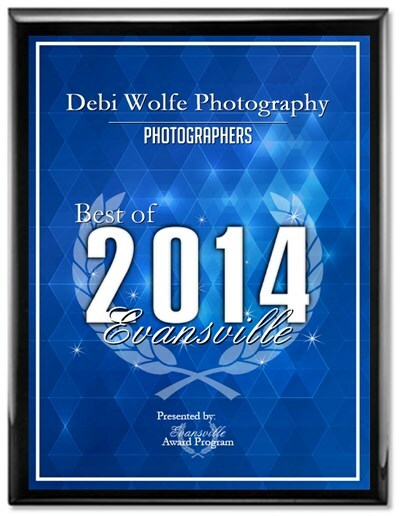 EVANSVILLE May 15, 2014 — Debi Wolfe Photography has been selected for the 2014 Best of Evansville Award in the Photographers category by the Evansville Award Program. Various sources of information were gathered and analyzed to choose the winners in each category. The 2014 Evansville Award focuses on quality, not quantity. Winners are determined based on the information gathered both internally by the Evansville Award Program and data provided by third parties.